From the A465 on minor roads. Please observe the Club’s one way traffic system whenever possible (drawn on map). Larger vehicles may have to use the up road in both directions. This is an extremely sensitive site; drive slowly and with consideration for local residents. The parking situation is extremely sensitive at this site. There is an alternative field parking system in place. The farmer will control what field is to be used. Use the field with the Green SEWHGPGC sign fitted (see page 10). Do not park in the field with the Red SEWHGPGC sign fitted. If the field is wet and muddy and you feel your vehicle could get stuck or you could cause damage to the field, do not enter the field. Either shuttle gliders up in a vehicle and park at the Pandy Inn or park at the Pandy Inn and walk up. Please ring ahead and check with the Pandy Inn Landlord to confirm this is OK. Pandy Inn number 01873 890208. After you call, post your response for others to see on the Telegram group – “SEW Sites Reports”. This will avoid the landlord receiving multiple phone calls asking the same question. If the landlord agrees we can use the pub car park for the day, it would be a nice idea if pilots could visit the pub after flying to show we appreciate the gesture. The field parking agreement is a condition of continued access for the club with the Brecon Beacons National Park. Do not park on verges. Bottom take-off (A) is a moderate carry from the car park. Get ready away from the small take-off area and do not block paths. Take-off can be turbulent in strong winds and it is easier to take off on the top take off when it is strong due to shape of the topography (B). Top landing can be tricky and should be treated with caution. Hang gliders should not attempt to top land whilst flying at min sink. The safest and most predictable top landing area (C) is well back on the shoulder, behind the track. Landing by the trig point is not recommended due to severe rotor. Hang gliders are advised not to attempt to land back on the lower take- off as the air can be very unpredictable. The main bottom landing field (D) can be identified by a barn in the corner by the gate. Retrieve vehicles may be parked in the field next to the gate, but don’t drive beyond the barn. Don’t park on the road. If the main field is occupied by livestock use the next field to the South (E), but beware of the trees in the SW corner. A scenic site with a ridge of around 10 Km (6 miles). 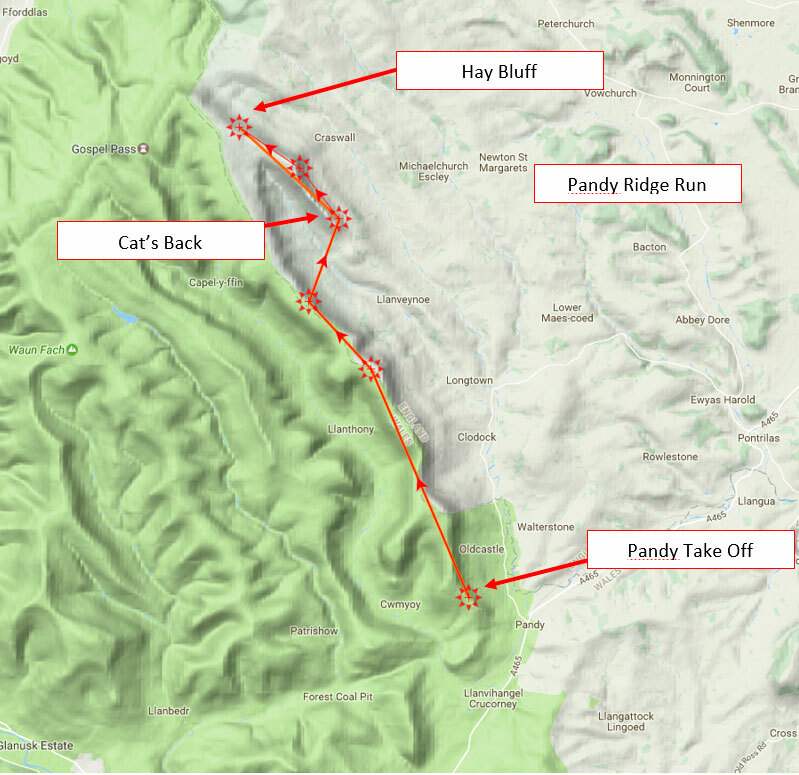 In the right conditions it is possible to jump the gap (“the Cat’s Back”) at the end of the ridge and fly on to Hay Bluff. Beware, the site can be turbulent in strong winds, particularly when it’s off to the North. Rotor can be severe in strong winds. Beware of rotor behind the large tree to the North of the lower take-off. Paragliders should not allow themselves to drop much below the lower ridge due to the turbulence caused by the trees not far below. Do not get caught behind the Cat’s Back in strong winds due to turbulence. Maximum of 2 competitions per year. Brecon Beacons National Park must be notified of all competitions via the club committee. Club Pilots with less than 10 hours, or a red ribbon, must fly under the supervision of an experienced pilot or Club Coach. Pilots can choose to keep their ribbon beyond 10 hours if they are not confident, so they are ideal candidates for coaching. Do not pass gliders over hedges, walls or fences. Always use gates and close them after use. Do not drive through other gates or park on the common. Do not drive on the Common or take off from the Cat’s Back. 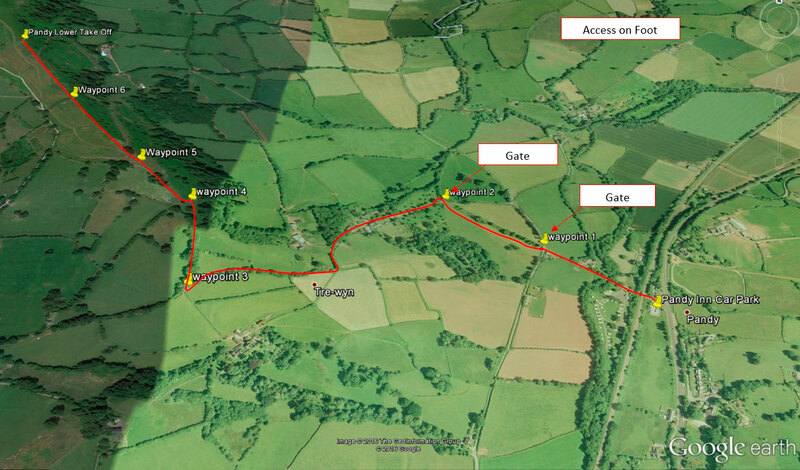 The site is closed between 1st – 21st May to allow stock to be settled on the hillside. 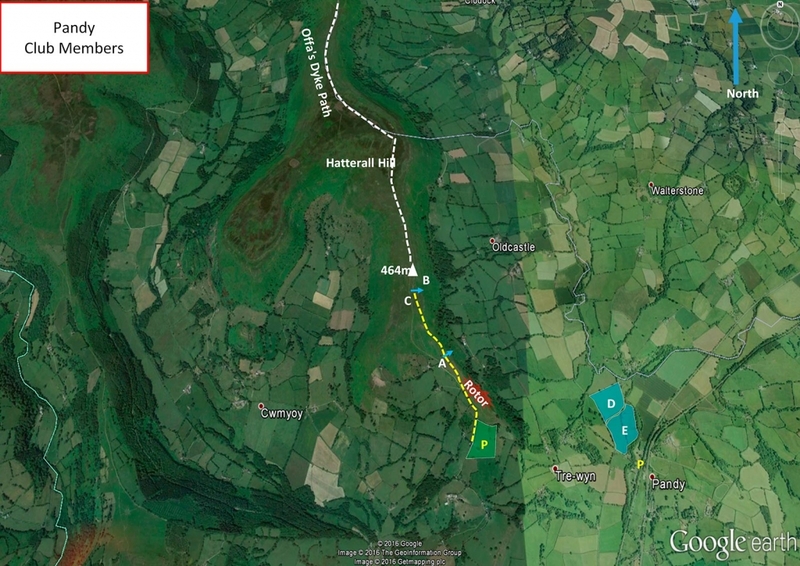 Great site for XC, whether it be running up the ridge hand railing Offa’s Dyke trail towards the Cat’s Back crossing or getting high and jumping back along the east ridges back towards Abergavenny and so on. 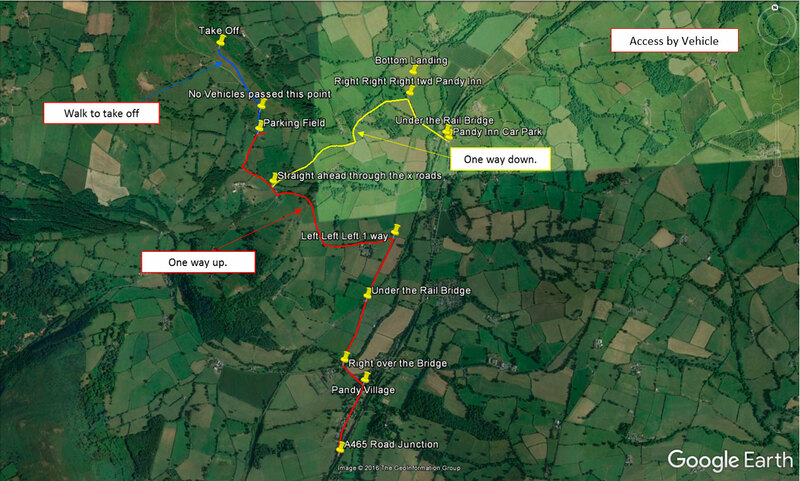 PG – Simon Green flew 104.3 km from Pandy on his Advance Omega 8 on 19 April 2014. Pandy ridge on Offa’s Dyke trail East side of The Black Mountains (Brecon Beacons National Park) near Pandy town on the A465.